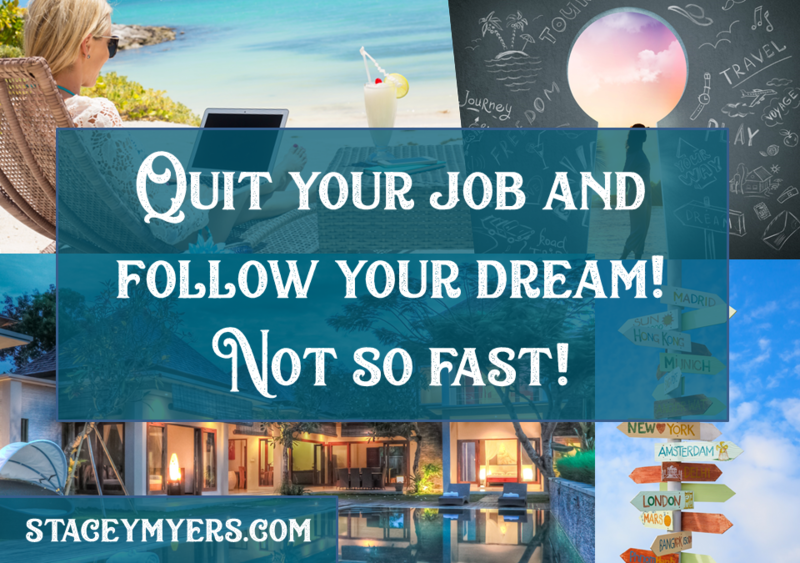 Quit your Job and Follow your Dream! Not so Fast! Quit your job and follow your dream! Work from the beach! Be your own boss! Travel the world! These seem to be the measures of entrepreneurial success. The ultimate expression of ‘Making It’! But what if you are building your business while still working a day job? 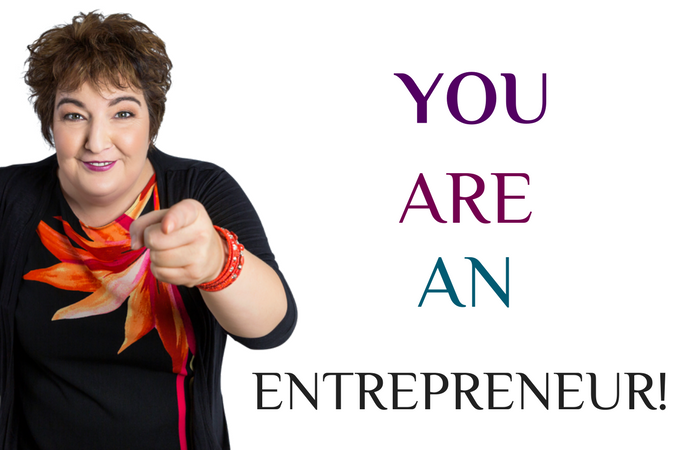 Does that mean you’re not an entrepreneur? Some might consider you a hybrid entrepreneur, or an aspiring entrepreneur, you could even be a wannapreneur or a budding entrepreneur. If you ask Gary V, you’re not an entrepreneur at all! I KNOW, right! What does he know? So, what they are saying is, that you aren’t successful – a true entrepreneur – until you have managed to ditch the 9-5. Entrepreneur – a person who sets up a business or businesses, taking on financial risks in the hope of profit. Have you spent any money on your business? Did you risk losing that money in the hope of making a profit? Even if you have a job! You know that you have money coming in so that at least your basic needs are covered. You won’t make bad decisions based on desperation, because you need money to pay your bills. You have more money to invest in yourself and your business. You can safely decide if entrepreneurship is even for you. Giving up a stable income, only to find themselves having to pick up another job because it took longer than they thought to build their business. Finding out the grass isn’t always greener on the other side. Losing confidence in their ability, and who they are, because even though they are smart they can’t quite work out how all the pieces of running a profitable business fit together. It took them longer than they thought it would to make any consistent money so have now given up on the dream of ever having a business. Have gone back to a day job with more debt than they left with. Feeling like they are failures and don’t have what it takes. When all they really needed to do was be a bit more patient – not buy into the ‘make it in a minute marketing’ that is out there. If you can’t run a business part time, what makes you think you will be able run it full time? Wise words about staying in your job from Ray Higdon. If only they had stayed in their jobs a little longer, perfected their skills, started generating a consistent income and only then, made the decision, to take on entrepreneurship full time. The business graveyard! Where too many good businesses go to die. You aren’t any less of an entrepreneur if you have a job and run your business on the side. I’d love to hear about your experience of this in the comments below. Are You Poisoning Your Mind with Your Mouth? So, poisoning your mind with your mouth. What do I mean by that? What we say has a massive impact on our beliefs about ourselves. Thoughts enter our heads and then there are a few things we can do with them. We can simply acknowledge we had them with a simple – ‘There is that thought again’, or, we can get into a dialogue, or back and forth conversation, with them. The other thing we can do is have them come out of our mouths. The other day I was watching a webinar and the host was saying that she struggles with using ‘um’ and ‘er’ a lot when she is doing a presentation. Every single time she verbalizes that she sends the message back to her brain and reinforces to herself that she struggles with it. What, of course, is going to happen? She will continue to struggle with it. What I invite you to do is, next time you have thoughts like; ‘Oh, I'm not very good at that,’ or ‘I shouldn't be doing this,’ or ‘Who do I think I am to think I can achieve that?’ is to just acknowledge the thought is there and leave it at that. When I say ‘acknowledge the thought’ I mean to just notice it, and that’s it. In the dictionary acknowledge means – accept or admit the existence of. What we don’t want to do is try to fight with it. If this works for you that is great – but for me this strategy is still giving power to the thoughts we are trying to ignore, because we are still spending time interacting with them. Affirmations are very powerful, but I don’t think this situation is the best place to use them. It’s all about just noticing it and moving on. I invite you to, next time you have a thought about yourself, just think, ‘Oh, there's that thought again.’ We don't even need to do anything with it, and we definitely don't need to share it with other people. It's not about keeping it a secret, it's because every single time we say it to somebody else, again, we're reinforcing that belief to ourselves. Instead you could say something like: I am working on improving the number of um’s and er’s I use when I am speaking. The other interesting thing is that these thoughts are mostly mean or unhelpful. We don't find ourselves naturally saying, ‘Oh, you're so wonderful,’ or, ‘That was really amazing what you did,’ or, ‘You're such a great friend.’ They are not the thoughts we have. We have the, ‘You're stupid’ ones instead. One other thing I want to touch on are the throw away comments that we have. I know I used to say quite a lot, ‘I'm really stressed about that’, or, ‘It’s really stressful, right now.’ When I stopped and asked myself, ‘Are you really stressed about that?’ Well, actually, I wasn’t. I don’t say that anymore. We have these little default phrases that we say to ourselves about things. They can be recurring ones. And they don’t serve us in any way. For a lot of years I thought I was the only person that had these crazy thoughts. I thought everyone else was all sorted and it was only me who suffered with such negativity about myself. It's not true! Every single person has them, it's how we're wired as human beings. 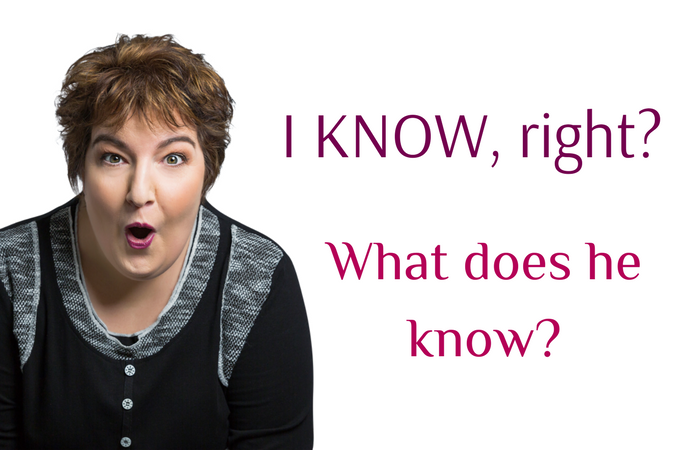 We all have them – it is just that my version (what I say to myself) might be a different to yours. I am interested to hear what types of things you say to yourself. Please also share how you get on applying this idea when you have unhelpful thoughts. I have spent the last few years running a business that supports people getting set up online. I really enjoyed doing it and had some success, but I didn’t love it. I had originally started an online business to promote my life coaching and somehow ended up showing people how to get set up online. Have you inadvertently followed a path that you didn’t consciously choose and now you are wondering how you ended up there? It’s a great place to be if you love it, but if you feel like it isn’t exactly what you should be doing then it might be time to reevaluate. It is also important to listen to yourself and not all the others around you. Everyone thought I should stay doing what I was doing because I was having success at it and making money. I kept stopping and starting, which was adversely impacting my business even more. I finally said enough was enough and that I was going to pursue what I am really passionate about – helping people create a life they love. Am I scared? A little petrified actually. It is easier with teaching and training to hide behind the content. With coaching we are bare for all to see. Spend a couple of minutes reflecting on if you are doing what you love to do or if you have somehow, accidentally almost, ended up doing something that you like, but maybe not love. Remember – just because you can do it, does necessarily mean you should. Do you get caught up with procrastination? I know I sure do. In show #16 I talk about some of the reasons we procrastinate and a strategy that was suggested to me by Blake Mallen. I also share what I have been doing since adopting this practice. I am sure it will be helpful to you as well. I have written a previous post on procrastination also. There isn't a person alive that doesn't suffer from it to varying degrees. What do you do to overcome your procrastination? Leave you comments below. I am in a very fortunate position to be part of a 2nd tier leadership coaching program with John C Maxwell. As well as the leadership calls and webinars we have been asked to read some of his books. I have loved personal growth for many years now and am always fascinated to learn more about myself, how we think and how we can continuously better ourselves. Everyone can have a happier, more fulfilled life by learning more and growing themselves. It is, however, imperative for people in business. There is a direct correlation between our own personal growth and the growth of our business. It is definitely worth the time to invest in setting goals, visualising what you want to achieve and discovering new ways to be a leader in your life. In show #11 I share some of the nuggets I have taken from the first chapter of John C Maxwell's book – The 15 Invaluable Laws of Growth. If you want to check it out – US version UK version. It is about ‘The Law of Intentionality' – Growth Doesn't Just Happen. Let me leave you with this thought from the book – ‘If you have dreams, goals or aspirations, you need to grow to achieve them'. What is your favourite personal development book? Leave the name in the comments below. Now is NOT the Time to Quit! How often have you felt like quitting on something? Giving up because it was too hard. In show #9 I talk about this and a few things you can do to keep going when you want to give up. What actions are you going to take? I would love to hear about them in the comments section below.